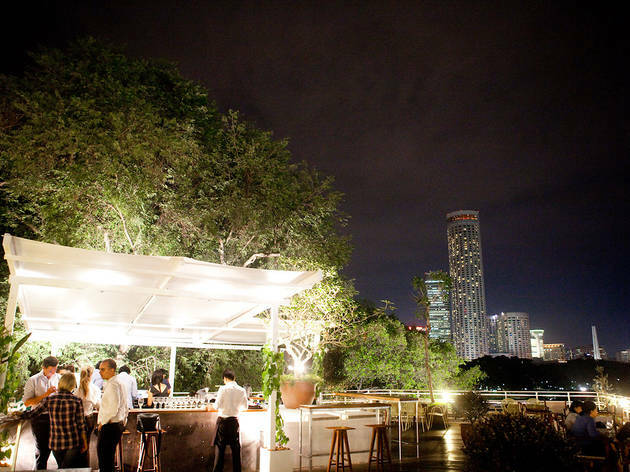 Far from the braying crowd of Boat Quay, this elegant but unstuffy rooftop bar-restaurant has been humming along quietly in its own hushed, lo-fi lilt since its soft opening in January. 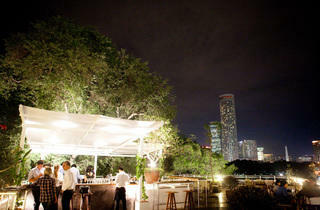 Set up at the rebooted Waterboat House on the lip of the Singapore River, it’s been a kind of badly kept secret between CBD sophisticates. The bar was originally embraced solely as an alfresco ante-room for the lower-level Boathouse – the promising- looking downstairs restaurant is also enjoying a slow-burning, culty following for its eccentric interior and modern European fare. But now, the bar makes for an appealing destination in its own right. Not least because of the view, which is stunning – and, you’d reckon, impossible to trump. But Prelude manages it with its soft, easy white lighting, a pleasing mix of furnishings – white, skeletal Konstantin Grcic-style bar stools, dark wood and canvas deck chairs – complementing the lush potted foliage and happily subdued playlist. The interior also serves to contain a comfortable, low-key vibe and succeeds at diffusing the bold, encroaching pomp of its overhanging neighbour, the Fullerton Hotel. The bar occupies a heritage building, but thankfully wears it lightly: this is not the stifling, snooty colonial nostalgia trip of, say, the Raffles Hotel. Even the prices are relatively affordable. At the bar, draught beers include the usual suspects, Stella Artois and its mildly more exotic Belgian counterpart, the low-carbon, citrus-y Hoegaarden, which makes a safe bet for warm-weather drinking. Bottled beers are more interesting, imported from Baird Brewing in Namazu, Japan. We were tempted by the Angry Boy brown ale and dry Shimaguni stout, but opted for something from the refreshingly cliché-free cocktail list. The signature Afternoon Delight, made of Earl Grey-infused shochu with a yuzu liquor, lacked presentational flair but had a satisfyingly fruity pep which rewarded the decision.